The seminars will take place the 7th of December 2017, at 10 am and 11 am, in the IECB amphitheatre, 2 rue Robert Escarpit Pessac. Metal ions are essential to life for all organisms. More than 30% of the enzymes present one or more metal ions in their active sites. They may have a structuring role vis-à-vis the protein, they may also be key in the recognition of a substrate or of a cofactor, or they may act as catalyst for the activation of substrates and small molecules such as water or dioxygen. The knowledge of these metallic systems is an infinite source of inspiration for chemists. The lack of knowledge of their role makes them a subject of fundamental studies essential to the understanding of life. The aim of our work is to design supramolecular systems that will mimic both, the coordination core, and the hydrophobic pocket of a metallo-enzyme active site. Our strategy relies on the synthesis of cavity-based ligands that allow the controlof the metal ion micro-environment, together with the approach and the binding of guest molecules. Since many years, we have been developing systems based on the calixarene scaffold, giving rise to the so-called “funnel complexes”. More recently, we started to explore metal complexes based on the resorcinarene scaffold, which provides a supramolecular environment different in shape, rigidity and binding properties, so-called “Bowl-complexes”. Reviews: Biomimetic and self-assembled calixarene-based receptors for neutral molecules, D. Coquière, S. Le Gac, U. Darbost, O. Sénèque, I. Jabin, O. Reinaud, Org. Biomol. Chem., 2009, 7, 2485-2500. Calixarenes and resorcinarenes as scaffolds for supramolecular metallo-enzyme mimicry, J.-N. Rebilly, O. Reinaud, Supramol. Chem., 2014, 26, 454-479. DOI: 10.1080/10610278.2013.877137. 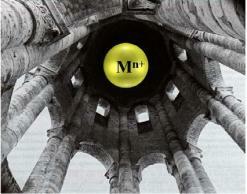 Biomimetic Cavity-Based Metal Complexes, J.-N. Rebilly, B. Colasson, O. Bistri, D. Over, O. Reinaud, Chem. Soc. Rev. 2015, 44, 467-489. DOI: 10.1039/c4cs00211c. Supramolecular Control of Transition Metal Complexes in Water by a Hydrophobic Cavity: a Bio-Inspired Strategy, O. Bistri and O. Reinaud, Org. Biomol. Chem., 2015, 13, 2849–2865. DOI: 10.1039/C4OB02511C. Supramolecular Modeling of Mono-Copper Enzyme Active Sites with Funnel-Complexes, N. Le Poul, Y. Le Mest, I. Jabin, O Reinaud, Acc. Chem. Res., 2015, 48, 2097–2106. DOI: 10.1021/acs.accounts.5b00152A. New directions are urgently needed in energy technologies, and in particular in hydrogen technologies, to raise efficiency and stability of the systems while lowering their cost. Bio-inspiration has a great potential to making breakthroughs in research and development. In particular hydrogenase enzymes compete with platinum as catalysts for H2/H+ interconversion and such an activity can be reproduced in synthetic mimics [1, 2] but such molecular systems are often challenged by solid-state catalysts, both in terms of activity and stability. We will show how the immobilization of biomimics onto surfaces allows the preparation of highly active electrode materials compatible with existing PEM electrolysis technology [3-6]. Besides, we will also revisit the structure of reactivity of amorphous molybdenum sulfide, which actually stands as a coordination polymer, therefore bridging the molecular and soli-state sides of H2/H+ catalysis . Besides, we will also describe our effort towards the combination of such catalysts with various photoactive motifs for the preparation of photoelectrode materials [8-10] that can be implemented into photoelectrochemical (PEC) cells for water splitting. T.R. Simmons, V. Artero, Catalytic Hydrogen Oxidation: Dawn of a New Iron Age, Angew. Chem. Int. Ed., 52 (2013) 6143-6145. T.R. Simmons, G. Berggren, M. Bacchi, M. Fontecave, V. Artero, Mimicking hydrogenases: From biomimetics to artificial enzymes, Coord. Chem. Rev., 270–271 (2014) 127-150. A. Le Goff, V. Artero, B. Jousselme, P.D. Tran, N. Guillet, R. Metaye, A. Fihri, S. Palacin, M. Fontecave, From Hydrogenases to Noble Metal-Free Catalytic Nanomaterials for H-2 Production and Uptake, Science, 326 (2009) 1384-1387. P.D. Tran, A. Le Goff, J. Heidkamp, B. Jousselme, N. Guillet, S. Palacin, H. Dau, M. Fontecave, V. Artero, Noncovalent Modification of Carbon Nanotubes with Pyrene-Functionalized Nickel Complexes: Carbon Monoxide Tolerant Catalysts for Hydrogen Evolution and Uptake, Angew. Chem. Int. Ed., 50 (2011) 1371-1374. T.N. Huan, R.T. Jane, A. Benayad, L. Guetaz, P.D. Tran, V. Artero, Bio-inspired noble metal-free nanomaterials approaching platinum performances for H2 evolution and uptake, Energy Environ. Sci., 9 (2016) 940-947. P.D. Tran, A. Morozan, S. Archambault, J. Heidkamp, P. Chenevier, H. Dau, M. Fontecave, A. Martinent, B. Jousselme, V. Artero, A noble metal-free proton-exchange membrane fuel cell based on bio-inspired molecular catalysts, Chem. Sci., 6 (2015) 2050-2053. P.D. Tran, T.V. Tran, M. Orio, S. Torelli, Q.D. Truong, K. Nayuki, Y. Sasaki, S.Y. Chiam, R. Yi, I. Honma, J. Barber, V. Artero, Coordination polymer structure and revisited hydrogen evolution catalytic mechanism for amorphous molybdenum sulfide, Nat. Mater., 15 (2016) 640-646. N. Kaeffer, J. Massin, C. Lebrun, O. Renault, M. Chavarot-Kerlidou, V. Artero, Covalent Design for Dye-Sensitized H2-Evolving Photocathodes Based on a Cobalt Diimine–Dioxime Catalyst, J. Am. Chem. Soc., 138 (2016) 12308-12311. T. Bourgeteau, D. Tondelier, B. Geffroy, R. Brisse, R. Cornut, V. Artero, B. Jousselme, Enhancing the Performances of P3HT:PCBM–MoS3-Based H2-Evolving Photocathodes with Interfacial Layers, ACS Applied Materials & Interfaces, 7 (2015) 16395–16403. T. Bourgeteau, D. Tondelier, B. Geffroy, R. Brisse, C. Laberty-Robert, S. Campidelli, R. de Bettignies, V. Artero, S. Palacin, B. Jousselme, A H-2-evolving photocathode based on direct sensitization of MoS3 with an organic photovoltaic cell, Energy Environ. Sci., 6 (2013) 2706-2713.